How do you open a museum that already feels closed? I asked myself this as I participated in the “grand opening” of the long-awaited, heavily scrutinized Canadian Museum for Human Rights in Winnipeg. Begin with the architecture: the structure is spectacular in a Darth Vader sort of way. Approaching the building with colleagues from CEREV and the University of Winnipeg’s Cultural Studies Research Group, I felt dwarfed by its immensity. Its rounded, earthy aspects remind me of Metis architect Douglas Cardinal’s Canadian Museum of History (formerly The Canadian Museum of Civilization). But inside, the effect of being “herded” along alabaster angular ramps reminded me of Daniel Libeskind’s modernist and deconstructionist tropes, including the Stair of Wonders, at the Royal Ontario Museum. The CMHR’s Tower of Hope and Garden of Contemplation recalls the Canadian War Museum’s Regeneration Hall. But while most museums addressing historical injustice and struggle offer memorial spaces to honour victims, the CMHR does not. The mixed architectural metaphors reflect the museum’s thematic diffuseness – it is not grounded by a major historical event from one place and time, nor is it anchored by a strong collection of material culture. Like a nineteenth-century universal museum, the CMHR is explicitly global. Arguably, Canada, with its diasporic communities linked to any number of historical and contemporary violations of human rights, is the right place for this museological experiment. But logically and morally, I argue, the museum should be grounded and engaged in the local struggles occurring on its doorstep, which reverberate nationally. As the CMHR opens in a celebratory mood, it is honouring its heroic founders and own creation story more than the collective histories and struggles it represents. One hopes this self-glorification will diminish in time, but the fact that the Tower of Hope is named for founder Israel Asper is a disappointment, and the sponsorship by Gail Asper, of the sponsorship wall, verges on parody. Meanwhile, during the CMHR opening ceremonies and “Rights Fest,” local indigenous communities dragged the Red River for remains or murdered or missing women, in the wake of the discovery of the body of 15-year old Tina Fontaine of Sagkeeng First Nation. The proximity of these events was surreal; the CMHR is located at the Forks, where the Red and Assiniboine rivers meet. The river lands reminded me of the edges of Vancouver a few decades ago, where one feels simultaneously the presence of marginalized communities and the forces of gentrification. Members of CEREV, as well as other out of town participants for the conference, Museum Openings: Caring for Difficult Knowledge Within and Beyond the Canadian Museum of Human Rights, were placed smack in the middle of this in our boutique hotel on the river with a view of a vigil fire. The fires that burned near the museum were remarkable for their blending of community activism and serving as containers for the emotional intensities of unresolved loss and waiting. On the other side of the CMHR, another fire burned to mark a protest by Shoal Lake #40 First Nation over human rights violations in their reserve, which has been geographically isolated by development, and has endured a boil-water order for 17 years, despite the fact that its lake provides fresh water to Winnipeg. A week after our conference, Shoal Lake established a “Museum of Human Rights Violations” on the grounds of the CMHR, following the best traditions of theatrical, place-based protest and performance. As academics with shared concerns over the ethical care of difficult knowledge, we dwelled on the politics of the CMHR, attempting to track its commitments and contradictions. As with the mixed architectural metaphors, so to is its mandate muddied by potentially competing demands including keywords such as inspiration, education, social action, and entertainment. Add to this a layer of constraints due to its status as a national museum, including a mandate to build a national collective memory, as opposed to collected memories. These institutional orders are familiar to public institutions in Canada, including the CBC, and they are difficult to negotiate in times of conflict, such as referendums. 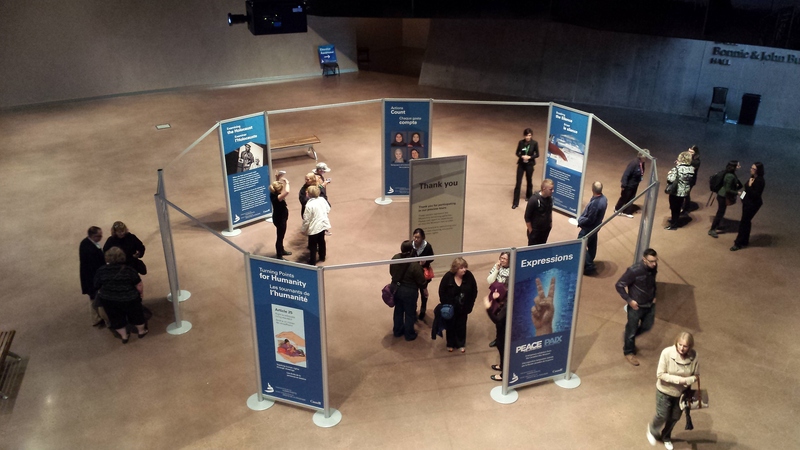 To date, the CMHR has operated as a stage for “hearing” dissent, without the use of heavy handed police force. But is the museum really unable to speak out in relation to the human and indigenous rights violations taking place underfoot? Is there an element of shame and hypocrisy, given that the Treaty 1 land upon which the museum stands, was only partially explored archeologically before building began? I am reminded of Thomas King’s story “Totem,” in which a rooted, unmovable, noisy, totem pole “interrupts” an exhibition of Atlantic seascapes taking place in the “Southwest Alberta Art Gallery and Prairie Museum.” The story parodies white colonialism and bureaucracy and nods toward indigenous resistance. It seems likely the CMHR will avoid an activist tenor – it was not born of community activism – but we need to be attentive to the “cracks” in the institution and alliance-building that occurs behind the scenes, or in the context of temporary exhibits and guest curation. A hopeful anecdote in the news this week is the fact that museum staff is regularly offering food and water to the protestors outside. Small acts of hospitality can be meaningful, as are “bad manners” (to use Thomas King’s words). This is not what we have in mind. As a discussant in our final roundtable session, I called for the partnership between CEREV and the Winnipeg Cultural Studies Research Group to produce the materials ourselves. It is an avenue we will explore, in collaboration with community partners, in our effort to engage the museum publicly. Shelley Ruth Butler was Acting Director of CEREV for the 2013-2014 school year and continues to be involved in developing our programming, structure and mandate as an affiliate.